Exclusive Milodon billet oil filter boss mounts the filter ABOVE the oil pan bottom, unlike others that allow the filter to hang unprotected below the oil pan. Another Milodon exclusive is the option of using either 1 of 2 filter sizes. The stock LS "long" 16 oz capacity filter OR the 40% larger K & N HP-2003 regular 1970s GM filter. All stainless steel hardware is included. Used with Milodon #31507 Pro-Touring or #30915 Street Strip oil pans. 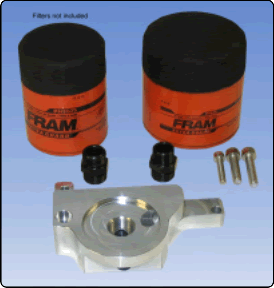 Similar to the High Performance Kit, this complete kit consists of a remote filter housing, which uses a Ford / Chrysler type filter, & (2) 36" 300 PSI working pressure lines & all necessary aluminum AN fittings. Billet aluminum plate mounts on the pan rail with (2) 10AN fittings exiting to the #21575 remote filter kit lines.